An expansive flybridge with an authentic ocean terrace and a forward cockpit that can accommodate a jacuzzi; just some of the hallmarks of a lifestyle worthy of the finest homes and affording the incomparable pleasure of owning a Flagship. 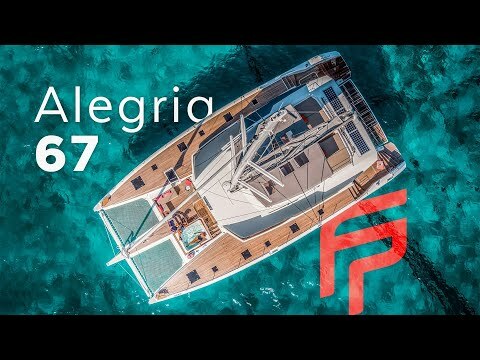 The Alegria 67, a trully catamaran yacht, evokes your finest senses, whether you are on the Flybridge experiencing the exhilaration of sailing or simply relaxing on the decadent lounges or sunbathing beds. The Alegria 67 is true to her name – the Portugese word for ‘joy’ – offering sublime relaxation spaces including an expansive flybridge, private lounges, foredeck Jacuzzi, a cockpit seamlessly integrated with a saloon featuring panoramic sea views, her Beach Club embedded gangway, and much more. • Owner’s version with an exceptional suite in its own hull. • Lounge version, which features a galley along the passageway so the saloon is exclusively dedicated to entertaining and relaxation. • One version in which the catamaran is designed with numerous cabins (each with ensuites) and crew space to meet specific requirements.